The Lake District National Park is seen by many as one of the scenic gems of the British Isles. The natural beauty has attracted many artists and writers through the centuries and today the same scenery provides the perfect backdrop to a wide variety of walks. 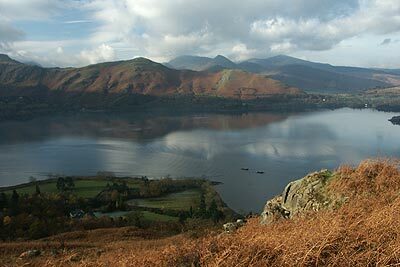 The National Park is located wholly within Cumbria with Windermere, Ambleside and Keswick the main tourist towns. For many this is the finest area in England for walking with a wide variety of scenery. Even on the busiest weekends it is possible to get away from the crowds by carefully selecting one of the less-visited fells. No description of the Lake District would be complete without a mention of one its greatest advocates - A. Wainwright. He was responsible, with his dry sense of humour and wonderful drawings, to get me started in the Lakes. AW gave me the confidence to head off into unknown country. Since the first fell, Low Pike on the Fairfield horseshoe, I am now making good progress with ticking off all 214 "Wainwrights" - a task that has been full of discovery and delight. Who can argue with Wainwright's regional classification of the Lakeland Fells? Well thought out and logical, his geographical split is impossible to better and it is with pleasure that I follow his example. The Southern Fells - the highest mountain in England (Scafell Pike) and some other equally impressive neighbours make this area an important one for all walkers. Included in this area are Eskdale, Great Langdale, Wasdale, parts of Borrowdale and the Duddon Valley all adding an extra dimension to the high ground. Add to this some industrial heritage and you have the perfect recipe for some interesting walks. Other great peaks include the Old Man of Coniston, Scafell, Great End, Esk Pike, Bowfell and the Crinkle Crags just to name a few! Favourite fells include Wetherlam, the Crinkle Crags and Lingmell. The Central Fells - To me this is the least dramatic area in the Lakes. However I must admit the Langdale Pikes do add some spectacular scenery and help provide Langdale with its deserved popularity. Even Wainwright shows some dissatisfaction and makes frequent comments about the boggy ground. From personal experience the ridge from Helm Crag to Greenup Edge has far too much "soft" ground for my liking with numerous detours from the main path a tedious necessity. Thinking positively the Langdale Pikes offer much to enjoy with airy summits offering great views across the valley to the many high peaks of the Southern Fells. Favourite fells include the Langdale Pikes, Great Crag (Borrowdale) and Loughrigg. The Western Fells - A wonderful area with many well-known fells. Great Gable, Pillar and the High Stile are all well known and form the basis of this interesting area. With mountain scenery par-excellence there is something for everyone in this superb area. Favourite fells include Pillar, Great Gable (of course! ), Haystacks and Red Pike (Wasdale). The valleys of Ennerdale and Wasdale are dramatic incursions into the mountains and perfect places to spend some time if the weather closes in. The North Western Fells - Quieter than many areas in the Lake District, the smoother outlines of this area indicate a change of geology from the neighbouring western fells. Grasmoor is the highest summit of the group around which are grouped many summits of slightly lesser stature. Favourite fells include Grisedale Pike, Eel Crag and Dale Head, which all make ideal destinations for a walk. Despite the steep climb from Lanthwaite Green, the Whiteside ridge is a great walk and well worth the initial effort. The Northern Fells - Heading west from the M6 motorway along the A66 to Keswick, the shapely and often forbidding south face of Blencathra is the first real mountain one encounters. Reaching Keswick, well situated on Derwentwater, the rounded form of Skiddaw comes into view. For many these two mountains form the extent of their interest, the fells at the back o' Skiddaw being ignored. However this area provides solitude and has the added benefit of often being clear of cloud when other parts of the Lakes are short of sunshine. Favourite fells include Carrock Fell and Bannerdale Crags. The Eastern Fells - The high land between Ullswater and Thirlmere includes a considerable amount of land above 2500 feet. The crowning glory is Helvellyn although Fairfield, St Sunday Crag and the Dodds all have their own particular merits. Besides the summits there is much to interest those forced to low level with disused mine workings and lakeside panoramas vying for your attention. Highlights of the area include the well-known Striding Edge. My favourites include the Dodds, Sheffield Pike and St Sunday Crag. The Far Eastern Fells - Used by walkers since the days of the Roman Occupation when the legions passed this way, this area provides miles of easy walking and panoramas extending to the high fells of the Pennines. Outwardly smooth, there are plenty of crags and constantly changing views down to the many expanses of water that fill the valleys. Favourite fells include High Street (using the route over Rough Crag for the ascent), Harter Fell and the Angletarn Pikes. Not to be forgotten is the wildly beautiful Nan Bield Pass - one of the scenic gems of the Lake District. Too often everyone makes a bee-line for the highest fells in the process ignoring the many notable fells of lesser stature. The Angletarn Pikes, Great Crag (Borrowdale), Souther Fell, Castle Crag, Loughrigg, Wansfell and Helm Crag all come to mind as great places to be at any time of the year. In reality all that is needed is to gain some elevation from the valley floor.